Darren Budd feels the future is bright at Worthing with the quality of the young players at the club. Budd, 33, began his career at Brighton and played for Bognor, Eastbourne Borough, Whitehawk and Burgess Hill before returning to Woodside Road for a second spell last year. 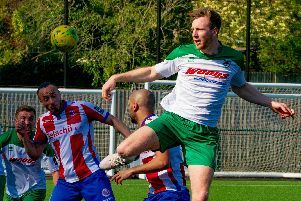 He was at Burgess Hill when Greg Luer left to join Hull in the Premier League – and he feels the crop of youngsters at Worthing is just as exciting. Budd said: “It’s brilliant here. I’ve been around for a bit and have seen a lot of very good youngsters come through and it’s a very exciting time here. “The likes of Jasper Pattenden and Luca Cocoracchio have only just turned 16 or 17 and are training with us every week and more than holding their own. The more they get used to being around a competitive squad, the more it’s going to be better for them in the future. "We had a young versus old game in training recently and there were two 19-year-olds in the old team. "That shows you how young our squad is but it's important for the younger guys to have a few old heads around, just for game management more than anything. "A lot of games are won by just a single goal in this league, you don't see many big hammerings, so it will be important we get them knowing what they need to do at the end of games when they need to shut the shop up and get results." Budd accepts he may have more of a squad role this season because of the midfield options manager Adam Hinshelwood has but he still wants to play as much as possible. He said: "I still get that buzz before a new season, even now at 33, it's still there. As long as I get that, I can't see myself stopping. "I want to play as much as I can but I can't expect to play every game because we've got such a massive squad. "I might find I'm a bit in and out just because of the size of the squad and we've got some great players coming through, especially in my position. "If that is my role, I'm more than happy to play it. "We've got Ross Edwards, who is a great player on the ball, Clarkey (Joe Clarke), Rhyle Ovenden, the younger guys like Tyrese (Mthunzi) and they're all capable. "If we've got injuries here and there, I'm sure Hinsh won't shy away from putting them in. "They've shown to me in training that they'll be able to deal with it." Looking ahead to the new Bostik League Premier Division campaign, Budd said: “Our aim is to just concentrate on ourselves and play the way we want to play, that will be the most important thing. Budd added one goal will be to finish top of the other Sussex clubs - Bognor, Burgess Hill, Whitehawk and Lewes - and said: "That's always the aim, especially for myself. "I've played for a few of the Sussex sides we're going to come up against. "It's always nice when you come up against other teams you've played for but first and foremost, you want to win. "I don't want to be sitting with my mates after a game and being the loser. "I'm the biggest sore loser you can get. With games like that, there's nothing you want but a win."